The games are coming thick and fast for Banbury United with an Easter weekend double-header coming up. The Puritans travel to Frome Town for Saturday’s Evo-Stik Southern League clash and two days later entertain Stratford Town. 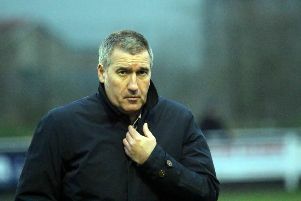 Boss Mike Ford said: “It’s always a difficult game at Frome, they won’t change the way they play. On their day they can beat anyone but on another they can lose to anyone. “I’m planning on Frome having one of their better days because they can spring a surprise on any team and I don’t want that to be us. Meanwhile, Ford reckons Jack Self could make double figures with goals if he starts to believe in himself more. Self opened the scoring against St Ives Town and Ford said: “Jack Self could end up with double figures.